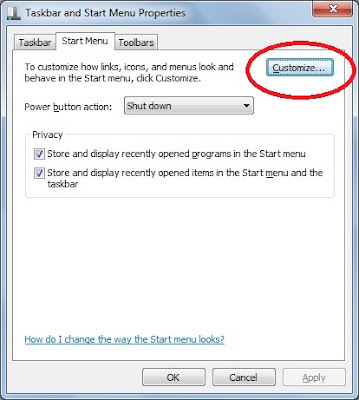 If you don’t see Recent Items list in Windows 7 start menu, you can add it by doing the following steps. Right click on the Start button. Select Properties. Click OK button. Now you are in Start menu tab. The above step only adds Recent Items link to the start menu. But you can see items added to the list only if the second check button in the Start menu tab (i.e ‘Store and display recently opened items in the Start menu and the taskbar’ )is selected. Note: The below group policy settings are applicable for a Windows 7 system. There is another related setting called ‘Do not keep history of recently opened documents‘. This one enables/disables the tracking of recently opened documents where as the above setting controls whether the list should be shown in the Start menu or not. If you want to see the list of recent items from start menu, then you need to leave these two setting either in disabled or not configured state. If you enable the first one but disable/do not configure the second one there will not be any recent items in Start menu though the recently opened documents list is being saved. Conversely, if you disable/not configure the first setting and enable the second setting, Start menu shows the link to recent items but the list will be either empty or it shows the list of documents opened before enabling the second setting. In Windows 7 clear recent items button is missing in start menu properties. How to clear Recent Items list then? In Start menu, right click on Recent Items link. Click on ‘Clear Recent items list‘. In Windows XP, this option is present in start menu properties. How to enable/disable recent items link using registry keys? The registry key Start_ShowRecentDocs under the node HKEY_CURRENT_USERSoftwareMicrosoftWindowsCurrentVersionExplorerAdvanced controls the recent documents behavior. Setting this registry key to 0 removes the link from Start menu. Setting it to 1 adds a link and Setting it to 2 adds a menu with list of the documents. Thank you. I had checked the box to "store and display recently opened items in the Start Menu and the Taskbar" in the Taskbar and Start Menu Properties window, but still could not seen my Recent Items. Your tip to use the Customise button has worked! Thanks for the message..glad that it helped you.. Which windows OS are you trying this in? I think the above should work for sure.. I found ExplorerSessionInfo and nothing else under Explorer. Something is missing from my system because I had an error a couple of weeks ago and had to rename the log files in the system32 folder. What is going wrong when you try to configure recent items through GUI? Advanced has many other registry keys..Are you able to use your system smoothly? If advanced key does not exist then lot of other things could be going wrong I guess.. I'm getting an odd issue where not all recent documents appear. There are differences between the list of recent documents in Excel 2003 and the list when I click Start -> Microsoft Office Excel 2003 and view the recent documents alongside. This is fine and it does indeed add the recent items via the Start menu. However, what this does not do is add recent documents to the dialog that appears when you are in Outlook 2010, when you want to attach a document to an email. This has been around since Windows 2000 days, but appear to be another example of Microsoft removing options people actually use. AHHH!!! :/. Only Recent Locations seems to appear, not Recent Documents. Once you are in there, drag the “Recent Items” to your folders list and that’s it. You’re done. 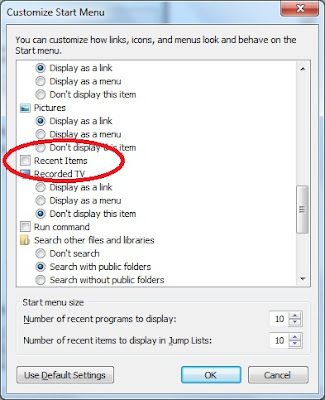 This is to get the Recent items to show up in windows explorer and NOT the start menu. Nice Tip. Thank you Moe for sharing this. simple and easy solution 🙂 thank you for sharing. Finally I can see my recent documents from start menu. I lost my ‘recent’ when we updated to Windows 7. At the time of our conversion, I thought it might be clever if I could to save my ‘recent’ files from our previous rendition of Windows in order to drop the files onto Windows 7 so as not to lose my recent history. My cleverness was able to save the list, alas, evidently, not to the appropriate Windows 7 location. From that moment, I cleverly lost the ability to see any ‘recent’ files going forward. Thanks for the awesome save!!! I recently upgraded to Windows 10. I hated it, so I downgraded back to Windows 7. Ever since doing so, I cannot bring up recently opened Excel or Word docs via Recent Items from Start Menu. I did as you suggested but all the proper boxes are already checked. I tried unchecking them, saving, rebooting, checking them back, rebooting. Nothing works. I have to physically open the program and open my sheet that way or just go to My Documents and open that way. Any ideas why? I had a similar issue after i upgraded to windows 10 and office 2016 and it turned out that the installation of office 2016 doesn’t uninstall the old version of 2007.
once i uninstalled the old version (control panel etc….) it worked a treat! Rock on, brother! This info came at the end of several hours searching. I just wonder what turned the Recent list “off”. oh well – all fixed. Thanks! Previous post: What is webclient service?